When it rains in Singapore, it really rains! You really don’t want to be out in this and even a brolly offers little protection. As with most tropical downpoars the rain often lasts only for a very short period and stops as quick as it starts. Because there is so much moisture in the atmosphere of course it is very humid and I mean, VERY humid! With my first photo, I took shelter and looking down one of Chinatown’s main streets, waited for some brave locals to emerge with brollies, making the photo a lot more interesting and also help identify whereabouts it was taken. As the rain continued to pour I zoomed in to capture something with a little more detail, trying to illustrate just how heavy the rain was. 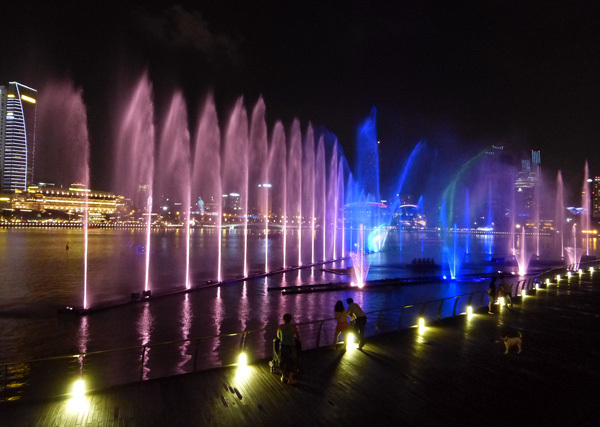 A Singapore ‘shower’ in full force. This shot benefited also from good contrasting colour, which is somewhat lost when cutting through a curtain of rain. Given that these giant decorations were made of paper and receiving the full force of the deluge, I am puzzled as to how well they were waterproofed. 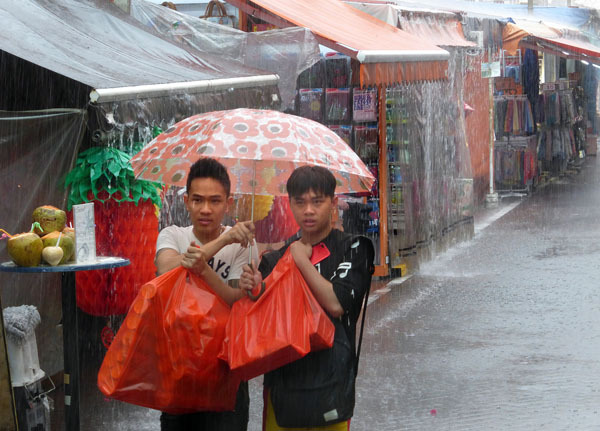 Clearly the shopkeeper was well prepared for the inevitable rain. 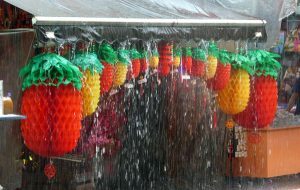 I also noticed that afterwards, whilst we in the UK we would have been calling the fire brigade, mopping up and finding it discussed in the local papers, in Singapore, puddles were few and far between once the rain stopped and everyone carried on as normal; presumably due to very good drainage. How us Brits love to discuss the weather! Moving on to a different subject (and sparing you the inevitable holiday snaps of one reposing on the beach! 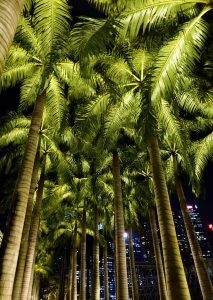 ), Singapore is a wonderful city to photograph at night. 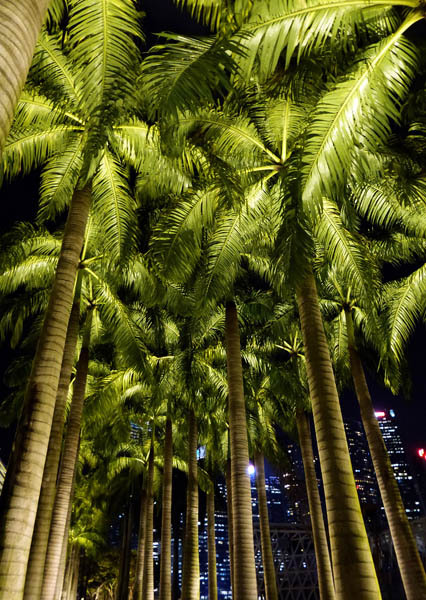 I was drawn to these majestic floodlit palm trees and thought how wonderful they looked against the black sky. I always find palm trees very photogenic, whether gracing a white sandy strip on a beautiful beach or silhouetted during a lovely sunset shot, this was something a bit different. The nightly light and water show. Still on the night photography theme, the nightly display of dancing water jets to the sound of music was great to watch and a challenge to photograph. The camera struggled to capture the true colours and hitting the shutter button and the best time to capture the most dramatic parts of the display was tricky. After all it moved very quickly. I also find it a bit of a shame to be spending the entire display staring at the back of the camera and concentrating. Anyway, as well as the shooting water, I liked the background of the Singapore skyline as well as the foreground with the couple (and the dog) giving scale and depth. 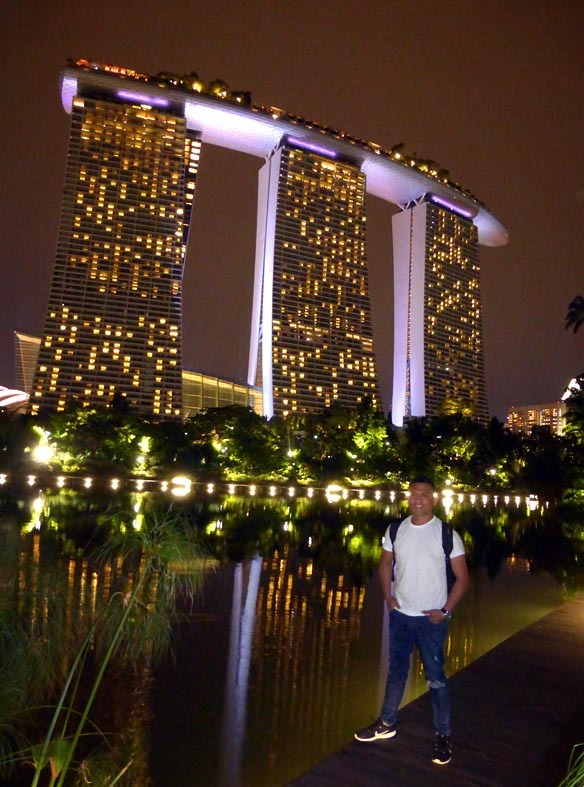 Iconic Singapore landmarks illuminated at night. 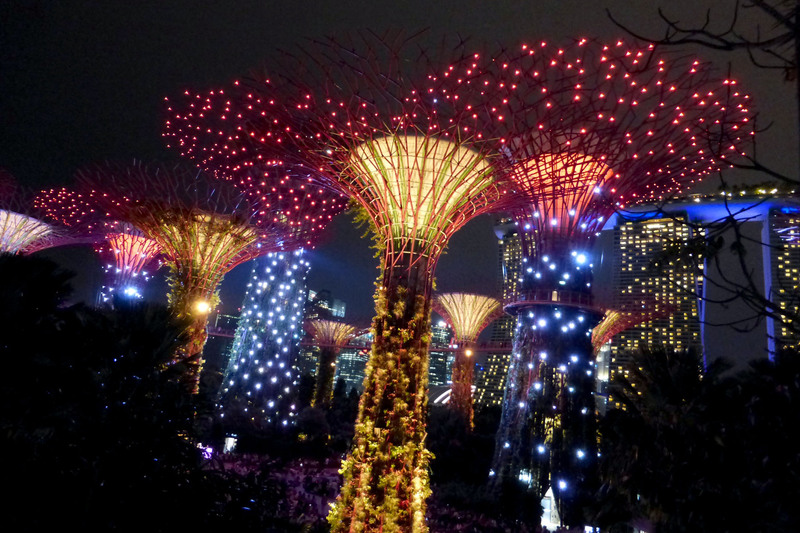 Measuring up to 50 meters tall, these iconic tree-like vertical gardens are designed with large canopies that provide shade in the day and come alive with an exhilarating display of light and sound at night. Iv’e seen this spectacle before on a previous visit, but this time from a closer and lower vantage point. There really is a lot to see in this wonderful city! Great location for a night portrait! 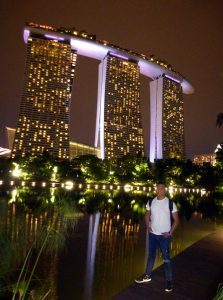 There can be few better locations for a dramatic night portrait than in the Gardens By The Bay with the landmark triple towered Marina Bay Sands Hotel in the background. Use a tripod (or use a stable surface) and ‘night setting with, slow shutter speed and fill-in flash on your camera.